The Aboriginal and Torres Strait Islander art collection at the NGA is the largest in the world and includes comprehensive collections of works by many of the most significant Indigenous artists in Australia. 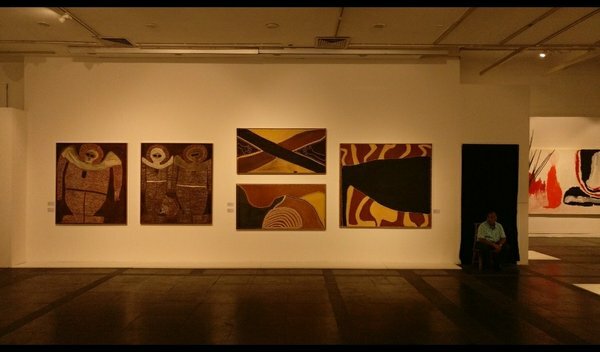 From rare, historical drawings to the dynamic Desert Painting movement and contemporary urban Aboriginal art, these works are a testament to the expertise, rich cultural knowledge and ingenuity of their creators. I'll try to post some photographs of the pieces I liked with some commentary in a few posts that follow. The ones below give a general sense of the scale of exhibits (and the lack of crowds). ETA: It'd be great to hear from some of our Australian members if these are really considered to be 'good' art in their home country. Now with hindsight, given the lack of crowds (well, it's Delhi - not the city of quiet contemplation, rather of action), and of advertising (a single press release by Australia high commission, and one article in The Hindu), i have to admit, I was quite lucky to get there. Before coming here, this exhibition was in Berlin - and was on for much longer. Anyhow, one doesnt realize the importance of whats on display till a bit of google search is done, as a result i did not photograph some exhibits and i certainly had no idea that the artists are quite celebrated within Aussie art circles. Austracism - Vernon Ah Kee . The exhibit uses language to reveal an underlying racial tension. Some of the language reads as follows 'I'm not racist but why cant they look after their houses properly I'm not racist but we did teach them english language I'm not racist but they're very primitive...' and so on. Its a play on the word ostracism and is quite poignant. Ash on Me - a juxtaposition of old found ‘opportunity shop’ ceramic and metal ashtrays, which are decorated with kitsch images of Aboriginal people and culture. 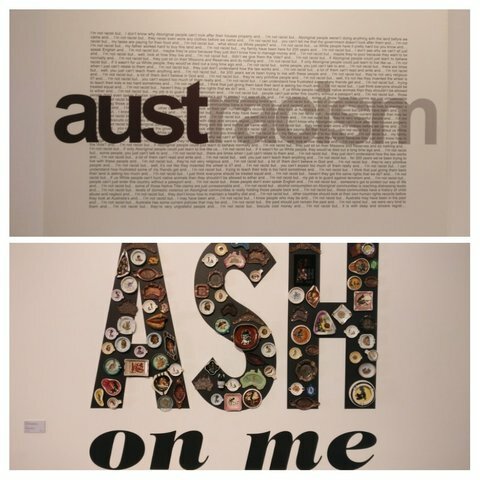 The artist's clever use of these objects crammed on to the word ‘ASH’ emphasizes their original intent: for cigarettes to be stubbed out on the faces of the Aboriginal men, women and children. These seemingly innocuous ashtrays transform into menacing symbols of racism. We are celebrating NAIDOC week in Australia. 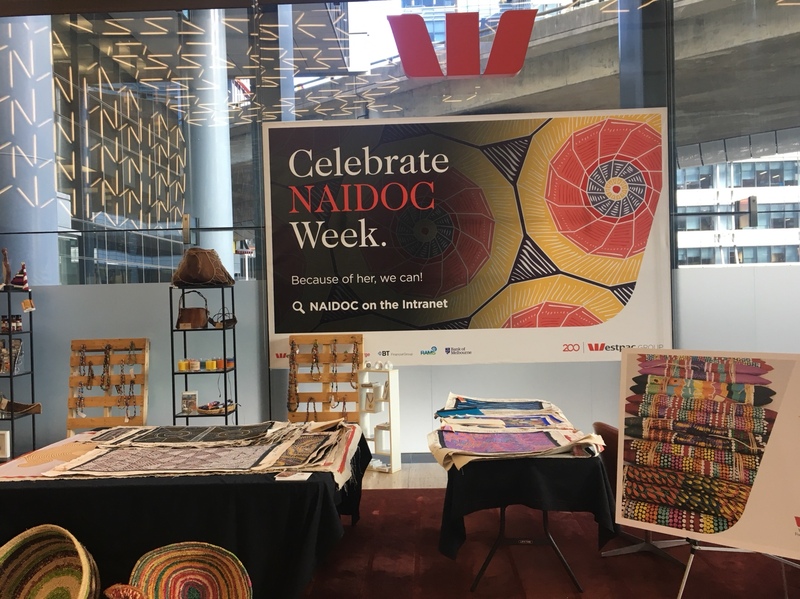 "NAIDOC Week celebrations are held across Australia each July to celebrate the history, culture and achievements of Aboriginal and Torres Strait Islander peoples. NAIDOC is celebrated not only in Indigenous communities, but by Australians from all walks of life. The week is a great opportunity to participate in a range of activities and to support your local Aboriginal and Torres Strait Islander community". In a section of the exhibition, at a glance, many paintings appear childlike, and were indeed passed over by many who came into this small room. They reminded me of paintings of central India though. 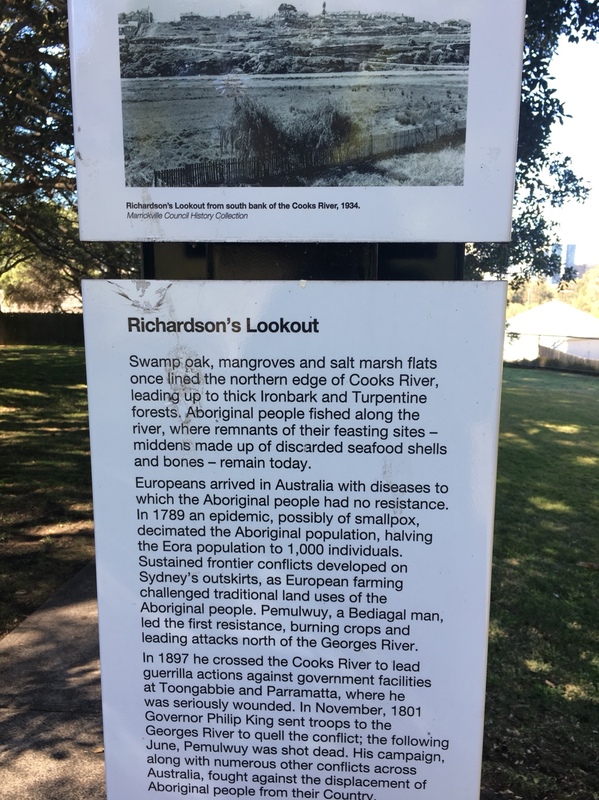 Another pioneering artist, activist and leader was William Barak, said to be a first inhabitant of Melbourne - https://en.wikipedia.org/wiki/William_Barak. Two of his Corroborree paintings are on display. Given that the NGA website shows there are only three in their collection, sending two here is quite a commitment! I was so tired by this time (sapped by humidity, and attempting jamun tree photos), that i didnt photograph the above, they are from the NGA site. A corroborree is fascinating - its a ritual congregation and dance performance of the indigenous Australians, during which they communicate with dreamtime. Dreamtime is something i had heard of earlier, and of the serpent, but of little else. More on that, shortly. A few exhibits in the small room where namatjira's paintings are, show indigenous recollection of events involving first contact - when large ships carrying British settlers arrived in Australia; and later waves of pastoral settlement. The individual men drawn, stick like figurines are reminiscent of warli paintings of Maharashtra and of the cave paintings at Bhimbetka. However, whats quite moving, is how faceless and nearly uniform silhouette figures are able to convey an emotion. Sample the two below. The lower is 'meeting the white man', in which the indigenous person is shown running away from the settler, the rest of his group appears confused. It's unclear what the settler carries on his shoulder. 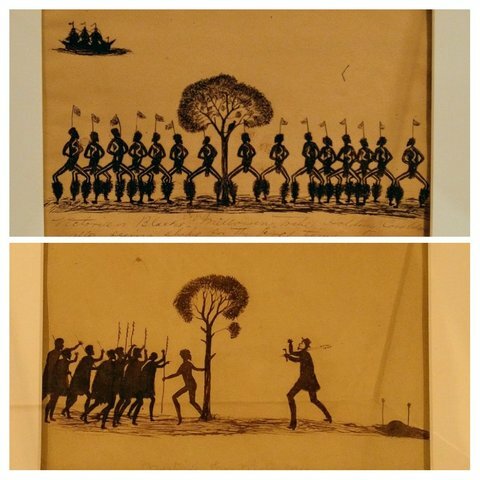 On top is 'Victorian Blacks - Melbourne tribe holding corroboree after seeing ships for the first time'. Ah thanks for the bump, had forgotten to complete - few more posts to go. 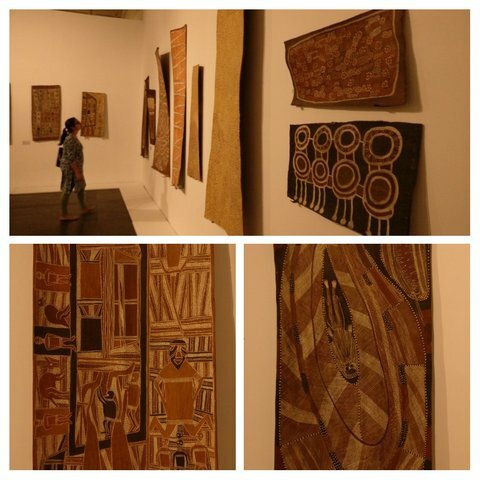 A section of the exhibition displays bark paintings - a traditional form of painting that uses eucalyptus (often called gum tree) bark as the base. It has come to be regarded as a fine art form now, and not so much a handicraft and earlier paintings (nineteenth century especially) are much sought after. Like most traditional forms, it must meet certain requirements - a clan may paint only certain stories or themes. The form is still practiced in parts of australia - northern and western especially. https://en.wikipedia.org/wiki/Bark_painting has more details. There are about a dozen pieces on display in the exhibition and are of varying size. The top photograph should give you an idea of the scale of the paintings. The bottom two are the paintings that are inserted again from the NGA site for clarity. Now, the two pieces that caught my eye - the coming of the macassan traders and rainbow serpent swallowing a woman. The macassan trader painting is important as it talks about a period of time in Australian history. The earliest records of the Macassan traders can be traced back to the 17th century. They were from Eastern Indonesia and visited Arnhem Land every wet season. For over three hundred years they collected and processed sea slugs for trade with China. This painting is from 1964. Celebrating NAIDOC week at work. In the same section, i found this piece symbolizing attempts of European Australians to 'assimilate' Tasmanian aboriginal children. 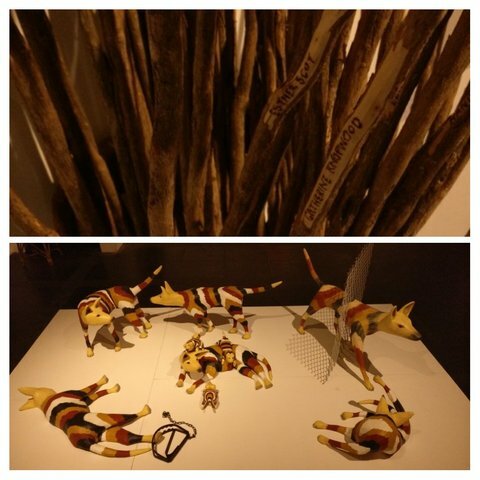 It is made of 'tea-tree' sticks with a given name etched on each stick. They're contained within a chair which is a 'found' piece. 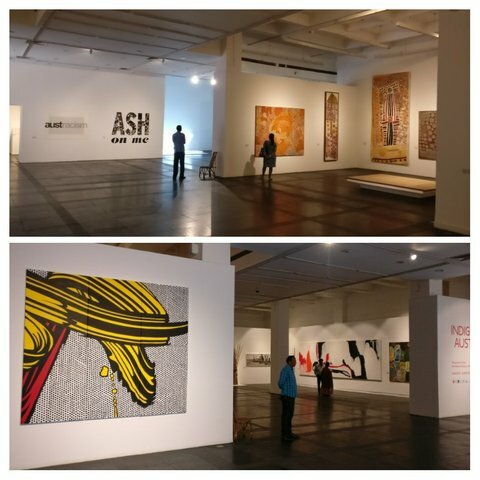 Thanks to lack of signage, I didnt spend enough time attempting to understand this section - the two paintings on the left are significant and as you can see from the size, are large, and rather enigmatic, like an alien looking at you. These are Wanjina paintings, at one point of time done in rock shelters. Further as described on the NGA site 'Unlike most Wanjina images that seem to stare far into the distance, those painted by Alec Mingelmanganu appear to be the audience gazing at the viewer, rather than being the subject of a painting. The close-set eyes lend a disconcerting air of questioning to the image. In turn, the broad hunched shoulders suggest that the Wanjina may not be all that comfortable with the world of humans.' The paintings are done in 1980. Area around in the neighbourhood used be a popular place with aborigines. Fresh water, plenty of food and rock shelters for poor weather. Unfortunately none remain in the area.